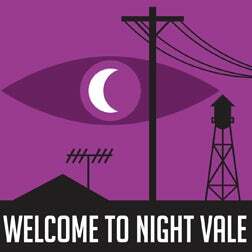 As many of you may know, Welcome to Night Vale has been on their West Coast tour and I managed to catch it on Saturday night. All I can say is, if you have a chance to go see a live show... DO IT.As many of you may know, Welcome to Night Vale has been on their West Coast tour and I managed to catch it on Saturday night. All I can say is, if you have a chance to go see a live show... DO IT.I am sure there will be different shows throughout the rest of their tour, but this one at least was one of the funniest episodes yet. have you ever laughed so hard you end up with a headache? Yeah that's what happened. I'll mention some bits about the show and the guests who were there but no details. The crowd was great and clapped, cheered and laughed for the entire show. Jason Webley, who has performed weather segments before, opened the show with a few new songs. He was also the guest artist for this episodes weather. He is such a fun performer to see live, he had amazing enthusiasm. Seriously it cannot be easy to leap about the stage with an accordion. Cecil was in fine form with that voice we know and love, a voice like swimming in a cool river. We also met the new voice of wonderful, beautiful, perfect Carlos who appeared with his perfect hair to assure us all that he was a SCIENTIST and scientists are always fine. No matter how many librarians there are. Some good news, we heard from intern Dana! Hard to believe but Jasika Nicole is even more adorable in person. Speaking of interns, we met the newest NVCR intern. Played by geekdom's very own Will Wheaton. Poor, poor intern Will. I saw several men in tan jackets, though.... I can't quite remember what they looked like.